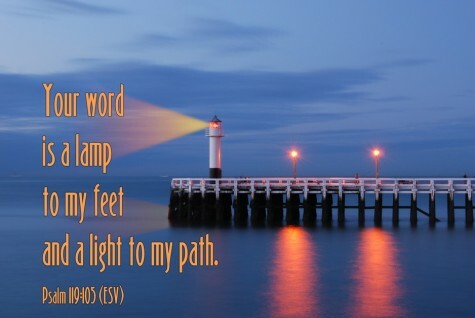 This lighthouse photo Scripture art has been a popular image to illustrate Psalm 119:105. The photo depicts a calm blue ocean at twilight with a dock extending to a white lighthouse with its beacon shining brightly out to sea and reflecting in the calm water below. A cone of light from the lighthouse beacon illuminates the words of this beloved verse from Psalm 119, and the overall blue tones of the photo lends a tranquil feeling to the scene. This Scripture art is a DevotionArt favorite and has sold on iPad covers, magnets, and even blankets. If this Bible verse Scripture art has touched you, consider spreading the message with these cards, prints, and gifts. Browse all products in the DevotionArt store.